on the McAfee Coliseum field. 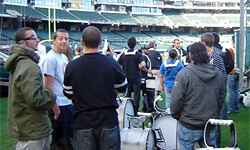 On Sunday, Nov. 9, a handful of members from the Santa Clara Vanguard (SCV) organization performed a six-minute routine during halftime festivities at the NFL's Oakland Raiders vs. Carolina Panthers game in Oakland, Calif. Organized by SCV bass drum alum Matthew Ring, the group comprised a cross-section of current and former SCV and SCV Cadets percussionists, plus SCV winter guard members. As part of the special Veterans Day salute to our nation's service men and women, the small performing group was broken down to seven snare drums, three tenor drums, five bass drums, and four cymbal players. The percussionists donned the green SCV Cadets uniforms alongside the 11 members of the color guard. Also performing with the Vanguard ensemble was the Travis Air Force Marching Band during the pre-show unveiling of a large American flag. "[The ensemble] did a drum cadence to all four sides of the stadium with a routine that included our winter guard performing with rifles and flags," said Vanguard CEO Jeff Fiedler. Members of the SCV winter guard. In light of the Veterans Day tribute this year, according to SCV alum Jason Nuckels, the group members were requested to be more military-like in their look and performance, hence the appearance in the Vanguard Cadets uniforms. And Nuckels, who provided photos from the event, was truly excited about having the opportunity to wear the SCV colors once again: "It was my first time in uniform in 22 years!"